Flash back: Chinese President Xi Jinping with Liberian President George Weah on Saturday ahead of the 2018 Beijing Summit of the Forum on China-Africa Cooperation (FOCAC). President George Weah is not in the mood to take lectures or instructions from self-declared super-politicians who think they have absolute control or carry the brains of some of the god fathers of politics such as Plato, Socrates and the rest of the linchpins of Romans’ political history. Instead, he is a self-controlling, self-motivating and self-convincing character who acts accordingly – at the most needed time – to do the right thing. Contrary to critics’ disposition, he is now in China where the stage is undoubtedly set for Liberia to milk from the country’seconomically opulent abundanceto enhance its own development program – the much hallowed Pro-poor Agenda for Development and Prosperity. It is a known reality that few weeks into his world-shattering ascendancy to the apogee of power witnessed the most of acidic vituperation in what appeared as a maliciouslyill-informedprotest against the decision to visit France over China and America, or other countries critics solely think are faithfully connected to Liberia in terms of bilateralism. Why France or what does Liberia stand to benefit from France were kidding concerns raised about the President’s trip to an emerging European power at the nucleus of the European Union framework that heralds mottled opportunities glowering at the country. Perhaps ordinary Liberians had wanted the President to indulge into paradoxical diplomacy – imposing himself on nations when there are laid down channels and procedures leaders used to reach out to one another – an attempt that perhaps would have proven counterproductively ruinous for the President and the country in the context of his understanding of governance, international relations and politics. But as a consequence of his strong belief in the witticism “there is time and season for everything,” the President chose not to bow to the so-called ‘King Nebuchadnezzars’ of Liberian politics but dogged to the rewarding state of calmness as he did when Providence did not visit him in 2005 and 2011- the two costly attemptshe made to become President of Liberia. That China and America or other nations some Liberians considered incredibly positioned to offer their country ‘modern manna’ did not top initial travel plans could be deemed as a form of brushoff and inconsiderateness to existing ties and their contributions only elucidated the lowness to which some Liberians bring their leaders or this president. Nevertheless the show of lack of understanding of political reality in the context of diplomacy and international relations, President Weah and his Government remain engaged with these nations through their respective representations as evidenced by the myriad of notes shared on several national and international issues. However, at the most anointed time, China has finally come and the President is apprizing the moment Beijing rolled out the red-carpet for him in a classical exhibitionof honor and dignity – a stark recognition of Liberia’s sovereignty and approbation of President Weah’s plan and determination to reshape a ‘backward Liberia.’Being in China at the invitation of the Chinese Government to join other leaders of Africa for the 2018 edition of the Forum on Africa-China Cooperation –FOCAC –only signals victory for the President over his avowed contradictors and antagonists who thought the worst would have come for the two countries under his leadership. While it may seem less important for some Liberians, is it is equally an absolution that the President is in China; a move that goes a long way in calming the torpedoing hurricane that slitthrough roofs of politicians or activists who often peck into every presidential action to milk or satisfy their egotistical understanding of statecraft. “I am happy to visit China; it will not be my first time going there, but the first as president of Liberia. 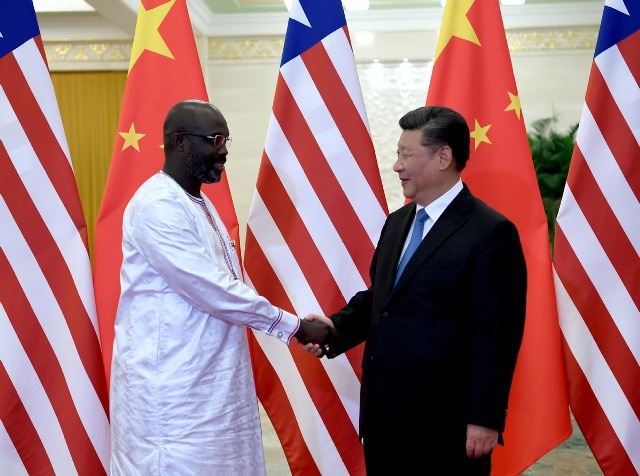 I hope to meet my colleague, President Xi Jinping, to discuss how we can strengthen our ties,” President Weah told Chinese media prior to his departure. While in China, the President promised to advance the Pro-Poor Agenda – lifting Liberians out of poverty – which is synonymous to the Chinese government’s policy to lift 40 billion citizens out of poverty by 2030. As someone who believes in the doctrine of appreciation, the President lavished praises on China for identifying and standing with Liberia during the plague of the Ebola Virus Disease (EVD), and said Liberia would forever remain grateful to the rising world power. The Liberian leader used the time to also weigh on in the China’s signature international development program, the road and belt initiative (BRI) which he said is aligned with his government’scross-country roads development program. Notably, the similarities the two leaders share in terms of providing greater social and economic opportunities for their peoples to take them from the abyss of low life to the height of prosperitymust be seen as a dawn of another dimension in Liberia-China relations. At the core of President Weah’s agenda is the wellbeing of the Liberians and the transformation of the nation as it is with President Xi under whose leadership China is experiencing unprecedented economic dynamism, quietly ascending into global dominance. For the class of Liberians who pretends to have the most accurate compass to leading the country beyond its undeserved foundation, there is no other intellectually equipped Liberian than they professed to be to change ‘Liberia’s somehow bemoaning story.’ But they are wrong! Also, they have to forever remember that there will be no rooms for their whims and caprices to sustain, as the stage is now set for Liberia and China to reshape their ties under their distinguished leaders who share the same transformative vision for their respective nations and peoples.This is why President Xi’s loan commitment (US$54 million), though not appreciated by some Liberians, is a vindicating benevolence representative of the new stage of China’s indescribable contributions to the development needs of Liberia in line with the government’s Pro-Poor Agenda– thanks to President Weah who has led the charge.